At Uncle Caleb’s cabin, Robbie meets Sam, a boy whose family also lives on the property. 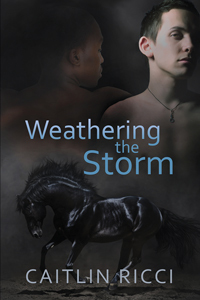 Finally he has a real friend who shares his love of horses, but Sam is black and openly gay. Both traits incur Robbie’s father’s rage. When his dad attacks Robbie in front of Uncle Caleb for standing up for Sam and himself, all of their secrets are thrown out into the open, and Robbie’s life is changed forever.